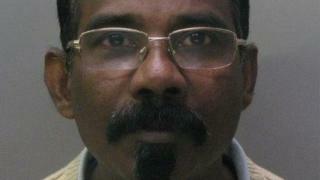 A care worker for vulnerable adults sexually assaulted a woman claiming he was giving her a head massage. John Thomas, 54, worked at a home in Huntingdon, Cambridgeshire, when he "wholly inappropriately" touched a young woman's naked breast in 2014. He also sexually touched another woman a year or two before, a court heard. Thomas, of Ringwood, Bretton, Peterborough, was jailed for 12 months after being found guilty of two sexual assaults. Cambridge Crown Court heard the first assault occurred in either 2012 or 2013. Then, in 2014, Thomas put his hand down a young woman's top and touched her breast, causing her "considerable shock and distress". Police said Thomas had claimed he was giving her a head massage. The court heard the allegations first came to the attention of police in 2017 and, after a jury could not reach verdicts in an initial trial, he was convicted of the two offences at a second. Judge David Farrell QC said the second victim required counselling and became depressed, adding she was "a young woman who undoubtedly suffered as a result of your totally unacceptable behaviour". He said he saw "no remorse" in Thomas, adding: "It is clear to me having seen all the character references and seen the pre-sentence report that you are clearly in denial." Thomas was also ordered to pay £1,000 in compensation to his second victim and given a restraining order not to work as a carer or in a care home for 10 years.